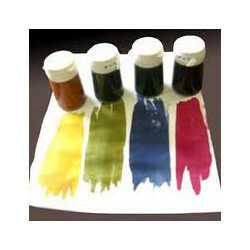 We offer Metal Complex Dyes to cater the demand of various industries like paint and textile. Metal Complex Dyes are known for its fastness properties and hence find application in dyeing of wool, nylon, silk. Further our range of Metal Complex Dyes manufactured as per the prevailing quality standards. Acid dyes are water soluble anionic dyes which are applied to fibres such as silk, wool, nylon & modified acrylic fibres from neutral to acid dyebaths. Attachment to the fibre is attributed, at least partly, to salt formation between anionic groups in the dyes and cationic groups in the fibre. Acid dyes are not substantive to cellulosic fibres. Acid dyes are used both commercially and by the studio dyer to dye protein/animal fibers such as wool, silk, mohair, angora, alpaca and some nylons and synthetics. Acid dyes require the use of an acid such as vinegar, acetic or sulphuric acid to set the color, acid dyes sound scary to some novices, who imaging that the dyes themselves are caustic strong acids. In fact, the dyes are non-caustic, are in many cases non-toxic, and are named for the mild acid (such as vinegar) used in the dyeing process, and for the types of bonds they form to the fiber. Some of them are significantly more toxic than fiber reactive dyes, while others are even safe enough to eat, and are sold as food coloring. Acid dyes are classified into several classes: 1, leveling acid or strong acid dye, 2, super milling or fast acid or neutral acid dyes 3, milling or weak acid dyes, and. 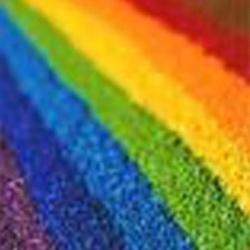 Leveling acid dyes are been sold under the trade names of kiton, erio, intracid, sandolan, and amacid, among others; they are also the acid dye component of all-purpose or union dyes such as rit and tintex, says knutson. It's difficult now to find out which specific acid dyes fall into which of these dye classes, however. At least part of the reason is that the information is not particularly useful to the dyer. Most histologic dyes are distinguished as acid or as basic dyes. An acid dye exists as an anion (negatively charged) in solution, while a basic dye exists as a cation (positive charge). For instance, in the hematoxylin-eosin stain (h&e), the hematoxylin-metal complex acts as a basic dye. The eosin acts as an acid dye. A very large class of dyes containing acidic groups, such as the sodium salts of sulfonic acids or phenolic groups. 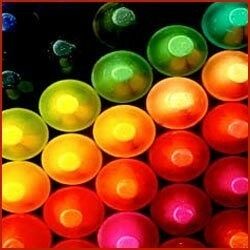 They are more soluble and have less tinctorial value than basic dyes but they also have greater light fastness. They do not form lakes with tannin. Acid dyes are used in dyeing leather, paper, etc., and their particular value lies in their ability to produce brighter, more uniform colors. They are normally applied from an acid dye _liquor (acetic, formic, or sulfuric acid); however, unless applied from a neutral or only slightly acid dyebath, i.e., ph of 6. 0 to 7. 0, their use is likely to result in acid degradation of the material dyed. Mordant dyes are those dyes which require a mordant in their application and which upon combination with the mordant deposit insoluble color on the substrate, e.g., dyes with metal chelating groups. Like the name suggests these dyes require a mordant. Mordants are substances of organic or inorganic origin which combine with the coloring matter and are used to fix the same in the production of the color. For the purpose of this class, such materials as oils and sulfonated oils, soaps, fats and higher acids, are not generally considered as mordants, but as coming within the scope of “assistants” in dyeing. The mordant substances include such acids as tannic acid, sumac, gall nuts, bark extracts, oleic and stearic acids, and turkey red oil; and metallic substances such as various combinations or soluble salts of chromium, aluminum, iron, copper, and tin. The latter, the metallic mordants, are more used than the acid mordants. Mordant improves the fastness of the dye on the fibre such as water, light and perspiration fastness. The choice of mordant is very important as different mordants can change the final color significantly. Most natural dyes are mordant dyes and there is therefore a large literature base describing dyeing techniques. The most commonly used mordant dyes have hydroxyl and carboxyl groups and are negatively charged, i.e., Anionic. It is convenient to view these as a specialized subgroup of acid dyes. Some other mordant dyes may possess amino groups, and are cationic overall. Despite this, they must still have hydroxyl or carboxyl groups, since lake formation requires it. Mordant dyes can usually stain by ionic interaction in the same way as other ionisable dyes. The color is often pale, sometimes so pale that the results have no value. It is often noted that when a mordant dye forms a lake with a metal, there is a strong colour change. This is because metals have low energy atoms. The incorporation of these low energy atoms into the delocalised electron system of the dye causes a bathochromic shift in the absorption. It is this delocalised electron system which is fundamentally responsible for color in dyes. Since different metal atoms have differing energy levels, the color of the lakes may also differ. Brief Process Of Rapid Fast (Azoic) Dyes On Cotton/ Viscose Textiles. The Rapid Fast are stabilized Azoic Dyestuffs specially prepared for printing. They are applied to the fiber in one operations. When developed under acid condition bright full shades are obtained which possess very good fastness properties. Due to cross coupling which may occur between certain Rapid Fasts, proper care should be taken when using mixtures of Rapid Fast as resultant shade obtained is un-predictable. 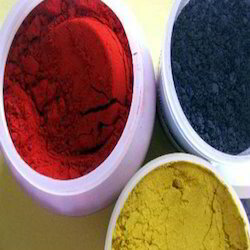 Dyestuffs of others groups may be used to supplement the color range, particularly for greens and blues. As the Rapid Fast can be developed by either neutral or Acid ageing colors of Rapid Fast vat or Rapid Sols may be printed alongside. In some cases Rapid Sols can also be printed in admixture with Rapid Fast eg., For producing Green shade, Rapid Fasts are largely used in block and screen printing, some printers prefer particularly for Rapid Fast L.Y. 3 GH, RED RH, G.Y. 2 RA, G.Y. IGK, to expose undeveloped print to sunlight and then acid developed.